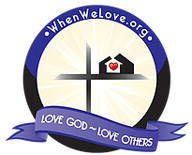 Preparation for bag packing will take place at WhenWeLove at 1100 E Lancaster, Fort Worth. This event includes setting up tables, counting items for distribution and determining lay out for bag packing to ensure efficiency on the day the bags are packed. Heavy lifting may be required. Bag packing will take place at WhenWeLove. Volunteers will pack about 500 bags for the summer relief project and 700 bags during the Holiday packing event. The time involved usually takes about two hours depending on the number of volunteers.